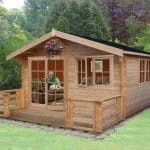 One of the most popular and good looking mid size log cabins on the market. This is a superb example of style, craftsmanship and quality. 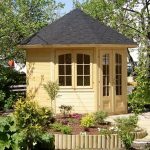 The attractive Marlborough log cabin is a true beauty with it’s own porch area, ideal to use for summer drinks or to escape into the shade. 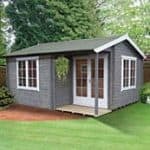 It has a smart apex style roof and functional windows and the double doors have plenty of panels of glass allowing lots of light and air inside. 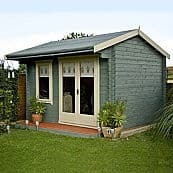 It is generous in size so there is room for furniture for you to relax in. 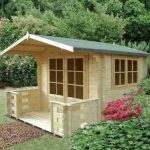 It is constructed out of hard wearing and long lasting wood and includes a small terrace, it’s an excellent example of a fine log cabin. 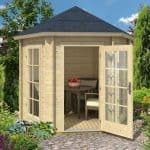 This product comes home delivered and assembled for your convenience.